Something about “tycoon” games makes them, in my opinion, either completely hit-the-mark-on-every-level or miserable-flop; there is no in between. We either get so hooked that we want to spend every waking minute watching our virtual bank balances expanding or would have more fun discussing our real life loan repayments with our bank manager. 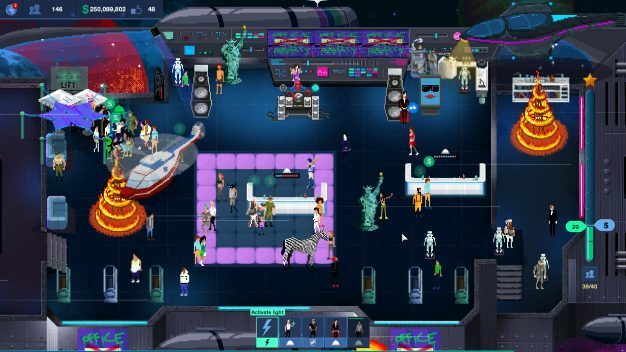 Let’s take this mode of thought into account while we discuss today’s game; Party Hard Tycoon. So you have to deck out venues for party’s and make money from the attendees. You start with just two venues but as you gain hype from happy party goers you’ll unlock more. Similarly, you start with three types of parties and will gain more as you go. You then have to kit your venue out with items fitting the party you’re planning for. You aren’t going to be putting wooden crates out in a high end club now are you? This involves a wee bit of thought. The same applies with food, drink etc. Take a room full of high flyers. A couple of beer kegs and a table full of sausage rolls probably won’t get you many likes. You’re choices have to match the tastes of the clientele. Something else you’ll need to put in is the right level of sound and lighting. Putting high end speakers into a college kegger isn’t really a smart use of your money. If you can get the right combination of effects, props and consumables you’re night should go off without a hitch. Also, as a bit of a no-brainer don’t blow your entire budget on one party or you’re going to be pretty penniless very quickly. You also have to staff your parties. Waiters and servers stock and … well … serve food and drinks. Security will remove the haters in short order and for some events a bit of a brawl spices things up. Excuse the stereotype, (I happen to be one of these sorts,) but what could be better to break a few noses than a biker with a baseball bat? As with everything else in the game the better you do the more employees will become available. You can only choose a certain number of these per party so you have to think what you’re going to need more. Some parties have more trouble makers than others so security, for instance, isn’t necessary on every occasion. Staff, just like everything else, also want paying so this needs factoring in to your budget. There is a certain level of depth that comes with not only juggling your money and deciding what you’re going to host where. You also need to pay attention to the type of fans that are coming to your parties. If you keep an eye on your calendar you begin to notice that different types of people go out at different times of the month and this gives you an idea how much you’re going to charge. All tycoon games involve a certain amount of micro-management, but thankfully Party Hard Tycoon doesn’t focus too much on sheets of figures and statistics. This means you aren’t going cross-eyed tracking what’s going on. It also means you don’t need a degree in mathematics to be able to get anywhere. So here we have a pretty solid looking tycoon game. It certainly has all of the makings to be rather a lot of fun. If making, (and spending,) money happens to be your thing. The biggest downside in this game is that it’s immensely easy to blow your budget. You’re rocking along quite nicely one minute and wondering where all your cash went and why you’re broke the next. I understand that the whole point is that you need to be able to carefully manage what you’re doing and that this is the challenge of the game but there doesn’t seem to be much, if any kind of a safety net. It’s fine making things trickier for experienced players but this is what difficulty settings are for. Give the newbies a bit of a break. Speaking of new, something else I’m not sure I like is the tutorial system. For me a tutorial should either come in the form of an instruction book or guide you through gently as you play. Personally I learn by doing so the second is always preferable. 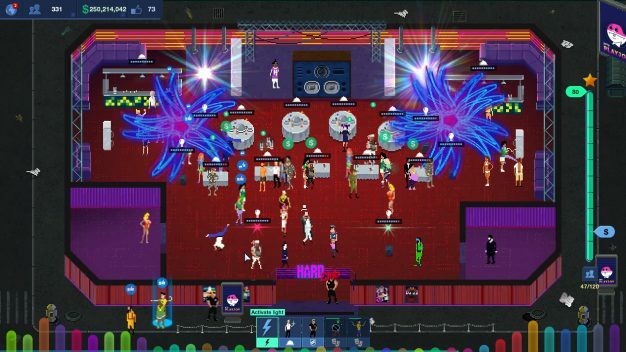 In Party Hard Tycoon you’re told what everything is and does but it’s before you actually go out and do it meaning you need a semi-good memory. I think this makes things a little rougher on new players and is going to be a bit more of a pain for people used to even the tiniest bit of hand holding. Graphics are pixellated. I get that this is the in thing at the moment but I think it lends itself to some games more than others. This look works really well in an adventure or shooter, (assuming of course it’s done correctly,) I’m less sure about a game of this type. Instead of looking cool and retro it looks a bit tired and outdated. This is entirely my perspective. Graphics are, (obviously,) very much in the eye of the beholder so I’m not calling this a massive issue, it just didn’t work for me. What I do love is some of the graphic art. You know the stuff you see in loading screens and cut scenes. This is colorful and beautifully done. So what do I actually think then? For me this game is a brilliant little time waster. This is the kind of title I reach for when I haven’t really got time to completely sink myself into something else. It’s great for an hour or so at a time. 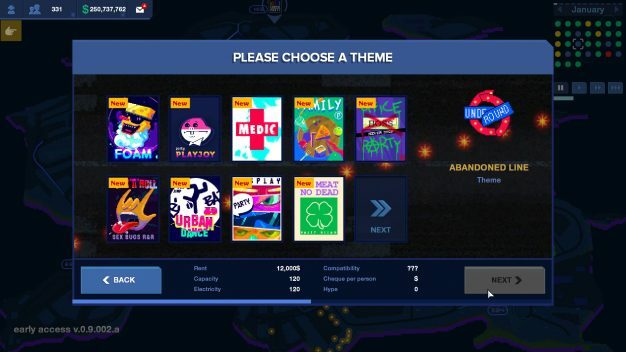 I’m less sure I’d go for a marathon session with Party Hard Tycoon. This being said you also have to remember that all those little bursts of play will soon add up so as a game in and of itself it’s still very playable. It’s currently an early access release and that this leaves loads of room for it to get better and grow, and I’m sure that it will. 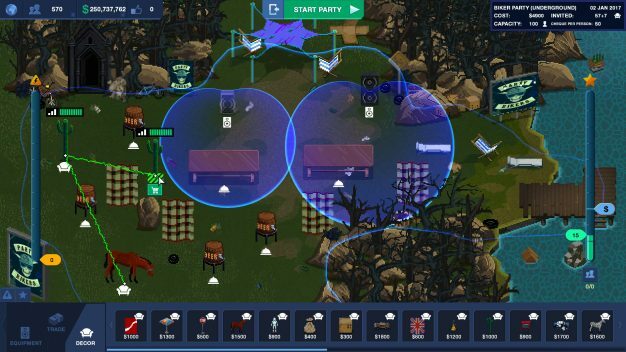 If tycoon games are your thing then I think you could do a lot worse than play Party Hard Tycoon, it’s not a mammoth ground breaker of a release but then it doesn’t need to be. Entirely worth a go and certainly a decent addition to your Steam library. Am I going to carry on playing it after this review? You know what? I think I probably am and when you have loads of other things waiting to eat your attention this is a pretty solid compliment. All in all … well done devs. This review is based on a retail copy of the game provided by the publishers.